If you've not had the pleasure of dining on tender, moist Chilean Sea Bass, consider this a stroke of luck! The natural... rich... buttery flavor is sure to amaze and delight you and the fortunate guests with whom you share this superb seafood entree. The large, delicate, moist flakes will seem to melt on your tongue... leaving you wishing for another, and yet another bite of this gourmet delight. To add to this, our delicious Roasted Garlic Mashed Potatoes pairs as the perfect side. Real Russet potatoes, butter and sour cream enhanced with chopped roasted garlic and pepper. For dessert, our delicious Sticky Toffee Pudding Cakes will leave you more than satisfied. These individually sized cakes are super rich and incredibly moist, loaded with dates and covered in a lusciously sticky toffee sauce. Our Sticky Toffee Cakes are made only with real, premium ingredients - baker's quality brown sugar, dates, cream, butter, and flour. Order this wholesome Chilean Sea Bass Dinner today! Thaw in Refrigerator. When thawing, remove from plastic packaging. Cover and refrigerate below 38�F. Once thawed, consume within one to two days. Quick Thaw Method: Unpackage desired number of fish fillets and place in a sealable plastic bag. Remove as much air from the bag as possible and immerse in cold water for approximately 30 minutes. SEAR ROAST: Preheat oven at 300�F. Pat dry and season desired number of fillets. Preheat an oven-proof skillet with 2 tsp. of cooking oil to medium-high. Carefully place Sea Bass in hot pan. Cook for 6 minutes on first side. Carefully turn fish then place skillet into preheated oven. Cook for 8-10 minutes or until fish is opaque and reaches an internal temperature of 145�F. PAN SAUTE: Pat dry and season desired number of fillets. Preheat a skillet with 2 tsp. of cooking oil to medium-high. Place Sea Bass in pan and cook for 5-6 minutes. Turn and cook an additional 5-6 minutes until fish is opaque and reaches an internal temperature of 145�F. BROIL: Preheat broiler and position top rack 2-3" from broiler. Pat dry desired number of fillets. Brush with olive oil or melted butter, season and place on an oven proof, foil-line baking sheet. 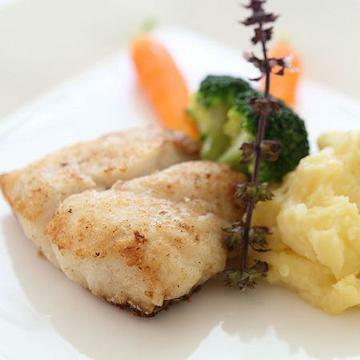 Broil Sea Bass 5-6 minutes, turn fillets and broil an additional 5-6 minutes until fish is opaque and reaches an internal temperature of 145�F GRILL: Preheat grill to medium or 400�. Season/oil grill grates. Pat dry and season desired amount of fish fillets. Spray fillets with nonstick cooking spray and place on grill. Grill fillets covered 5-6 minutes, turn fillets and grill an additional 5-6 minutes until fish is opaque and reaches an internal temperature of 145�F. Do not thaw. Microwave (1100W): Remove cake from plastic wrapper and place right side up on microwave safe plate. Heat on High for 1 minute. Invert cake onto plate, remove cup and serve. Oven: Preheat oven to 350�F. Remove cakes from box and plastic wrapper. Place cakes right side up on a baking sheet. Bake for 14-16 minutes. Let cakes stand in their cups for 1-2 minutes. Invert cake onto plate, remove cup and serve. Ingredients: Chilean Sea Bass, Water, Salt. Contains: Fish (Chilean Sea Bass). Ingredients: BROWN SUGAR, DATES (DATES, OAT FLOUR), WATER, CREAM (CREAM, MILK, CARRAGEENAN), BUTTER (CREAM, SALT), ENRICHED FLOUR (WHEAT FLOUR, NIACIN, REDUCED IRON, THIAMINE MONONITRATE, RIBOFLAVIN, FOLIC ACID), EGGS, NATURAL FLAVOR, SALT, BAKING POWDER (SODIUM ACID PYROPHOSPHATE, BAKING SODA, CORN STARCH, CALCIUM SULFATE, MONOCALCIUM PHOSPHATE), CARAMEL COLOR, BAKING SODA, CORN STARCH, TAPIOCA STARCH. CONTAINS: WHEAT, EGG, MILK. MAY CONTAIN: ALMONDS, PECANS, COCONUT, SOY.